Jeff Messina likes to have a theme for his classes, which is something I wish was common to more schools. The theme while I was there was the triangle, so the warm-up drills were focused on that as well as the techniques. 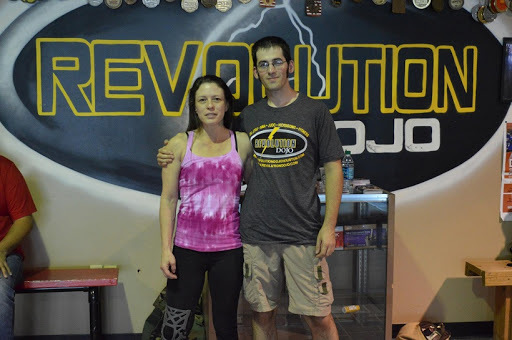 I sat out much of the warm-up due to my injury, as did Jodi, who has unfortunately hurt her knee. I joined back in a bit later, with an interesting triangle drill from inverted guard, which also works hip movement. Lie on the floor with your head pointing towards them. Grab both of their sleeves. Swing your leg up into their opposite armpit, then use that to swivel around, making sure you spin towards them. 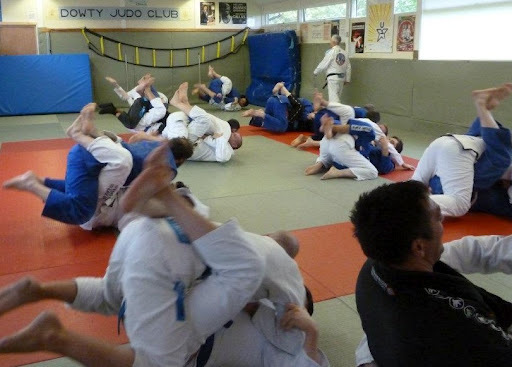 Kick the leg through, using it as an anchor point to pull yourself into a triangle, the other leg going into their neck, after which you can lock up the submission. I could only do it on one side, unfortunately, but a great drill either way. Next up was a relatively standard triangle set-up, where you use a scissor sweep motion to move into the triangle (similar to what Scott McVeigh showed in Glasgow a while ago). Grab their collar and sleeve on the same side, then still on that side, also push their hip with your foot. Bring the other knee across their other arm, as if you were going for a scissor sweep. Use the combination of that leg pressing with your grips to dislodge their grip on your jacket on trousers, swivelling the leg around so that it wraps around their neck. This should also pull them forward and break their posture, particularly as you’ll also be pulling their collar and sleeve. Use that broken posture to bring your other leg into play to lock up the triangle as usual. The next set up was definitely not standard, building on the warm-up drill. This time you have a lasso spider guard. You have the lasso and are grabbing both sleeves. Switch grips, so that you pass the lasso sleeve to your other hand. Grab their collar with your free hand. Just like the earlier drill, spin through, kicking your lasso leg for the triangle. Keep your other leg so the shin is up on their thigh, pushing off that for the rotational energy. You want that knee to be there as a barrier, so they can’t drive forward. Once the leg is up, you can control the back of their head with your knee before swivelling it into place over the back of their neck to cinch up your triangle. Jeff then showed the same motion, but this time in half guard with a spider guard grip. The technique is the same, except that you first have to free you leg from between theirs, by making space with your grips. More work on the triangle tonight, beginning with entries. From guard, grab one of their collars with both hands, then pull them in with both your arms and your legs. As soon as their posture is broken, grip their armpit on that collar side with your opposite hand (so, you’ll have a grip over their back). Shrimp out slightly, then you’re going to get inside their arm, again on that collar side. If there is some space between their elbow and your side, insert your elbow and hook your hand around their bicep. If not, slide your hand under from the outside, then swim it inside to grab the bicep. Next, wedge your knee behind, then scrape their arm over your knee, until you can bring your leg through: you want to end up with your knee fairly high. Take hold of their wrist, then swivel your leg around their arm, bringing that leg into their neck. You may need to shrimp out slightly more to help with that motion. Raise up your hips and push their arm across to the neck leg side, then lock that arm in place with your same side elbow. In sparring, we started off with the ‘jiu jitsu chess’ flow roll. Each person is allowed two moves, then the other person has a go. Even more than a typical flow roll, this allows you to play with techniques you might not normally attempt, as it puts you into unusual positions. For example, I ended up doing a sweep from turtle into a kneebar, which I would never normally do in sparring. Also more messing about with inverted guard, armbars under side control and various techniques that generally aren’t part of my game but fun to play with in drills like this. When that then progressed to free sparring with Dónal, I was mainly concentrating on bracing my arms into his shoulders and hips to prevent him passing. When I had a chance to try and pass, I kept that experimental mindset from the chess drill and ended up pulling the tail of his gi tight against his leg, to see if that would help. It didn’t particularly lead to anything, but meh, fun to test out the possibilities. I also briefly had a go at my favoured tripod sweep without much luck. Next up was a white belt, where I attempted the triangle set-ups we’d learned, but I didn’t control his posture properly. I was too loose when switching to the cross choke and then armbar, finally shifting into an omoplata, where I didn’t control his back quick enough meaning he could roll out. Still, following him up that did at least mean I could then spin into side control and slide through to mount, which is where we spent the rest of the roll. I was fiddling with an ezequiel choke, but failed to get it in smoothly. My hand was across, but I didn’t think I could finish it without crudely digging into his windpipe, so let go and looked for something else. I should review my notes on the Roger choke at some point, as now that I seem to be getting better at maintaining mount (at least on people around my size), it’s time I worked more on those fundamental attacks. Tonight’s class continued with guard, this time a submission. As usual, Dónal ran through loads of drills to start, before progressing into the main technique, setting up the triangle. Grab their same side collar and pull them in towards you to break down their posture. Your other hand should be positioned on their same side forearm, slightly below their elbow. Push their arm backwards, then immediately bring your thigh to their neck. The reason you don’t instead push on their wrist is so that they find it more difficult to block your leg with their elbow. Once you have that leg in position, clamp down, keeping your other leg tightly pressed into their side throughout. Don’t try and jump both legs up at once, or they may be able to time it so that they have both arms outside and can move straight into a double underhooks pass. Instead, establish the first leg, then bring your other leg over to lock your ankles together. Squeeze your knees, and you’re ready to move on to the triangle itself. However, that wasn’t going to be covered in this class, as it’s only an hour long. Instead, we went into sparring, where again I went with Tony. Like last week, we focused on specifics, even more so than usual. I was playing with side control last week, where I’m fairly comfortable. Today I decided to play with mount. Generally I’m quite comfortable there too, but my main mount is low with grapevines. Due to Tony’s knee injury, I instead stuck with high mount. Now, I’ve been having more success from high mount than before, but I was reminded tonight how much less stable I am there compared to low mount. Tony was able to wriggle his knees in each time, getting to a position where he could brace both his shins inside one of my legs, then use that to make space and escape. It was an interesting test of balance, as well as a good opportunity to experience the kind of way I tend to try and escape mount, as like Tony I’m also a small guy who is used to digging my way free with knees and elbows. 😉 After that, Dónal moved into another cool drill, this time for sparring. You may be familiar with flow rolling. There is a step before that, where you take the BJJ chess metaphor to a literal level, sparring move by move. This apparently is something Hélio enjoyed doing, particularly in his later years when his mobility had declined. The idea is to take it in turns to do a technique, then freezing in place while your partner responds. It makes for an interesting experience, providing the opportunity to think carefully about your next move (not often afforded in the midst of sparring) and try out things you might not otherwise attempt. In an ideal world, the warm-up for every class would feature flow rolling. I think it is an invaluable tool, particularly for beginners, as it teaches so many virtues of BJJ: for example, the ability to relax, to flow and to experiment. Christian Graugart did a great video on flow rolling here, which is well worth checking out. The art we practice is called Brazilian Jiu Jitsu. Its royal dynasty is unquestionably the Gracie family: though other names are also important, like Omori, Franca, Fadda and of course Maeda, not to mention the Machados (cousins to the Gracies), it is the progeny of Gastao Gracie Sr who have had the most visible impact on the sport. However, Gastao’s father was not a Brazilian. He was a Scot, George Gracie, who lived about 20 miles north of Dumfries. 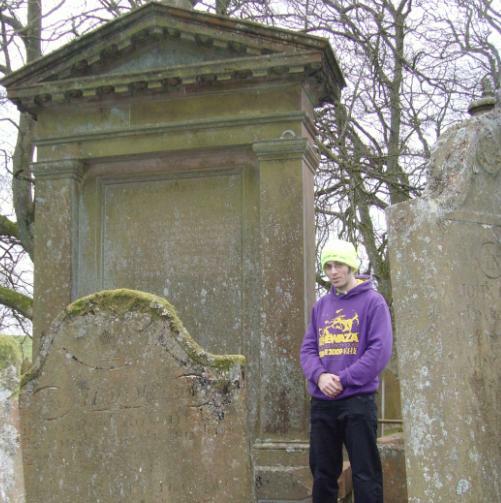 In 1826, George left the parish of Morton in Nithsdale (I’m still not sure if the specific village was Carronhill or Carronbridge) for Rio, returning in 1859 to the land of his birth in order to erect a memorial to his late father, James. This week I’m on holiday in the same area of Scotland: given my keen interest in jiu jitsu history, I knew I had to go see that tombstone. It’s located in a small graveyard by a ruined church, Greenhead Cemetery. It was a bit of pain to find the exact location, so if you’re planning to take a look too, save yourself some research by clicking here. If you don’t have a car (I was very fortunate that my gf was willing to drive), then from Dumfries, you can take the 436 bus to Thornhill, then walk for about thirty minutes up Manse Road until you reach the graveyard. The site is on Google Streetview, where you can see the large gravestone George established. There are also several pictures from Reyson Gracie’s 2009 visit (written up here), which is what initially inspired my own mini-pilgrimage to the site. Finally, you can take a look here and here. Looking at photos online is all well and good, but I wanted to be there in person, as well as get in some close-up pictures. I knew from what I’d read on the net that there was an inscription from George, though it was hard to make out. According to that Reyson article, it says “Erected by their son, George Gracie of Rio de Janeiro, 1859”, which looks about right. At the top, it appears four of George’s siblings died very young (I’m guessing that wouldn’t have been unusual in the early 19th century, presumably from disease), but his father lived to 85, so that long lifespan may run in the family. Hopefully one day somebody will raise up the cash to restore the gravestone before the words are completely obscured. 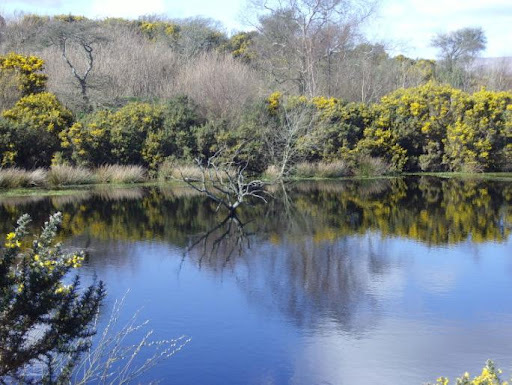 Kirkcudbright is a good location for heading off on walks around the Galloway area, along with a few more unusual attractions, like the excellent Cream O’Galloway visitor centre (quite cheap too, at £6.50 for entry and a tour). That used to be just a farm, but since they diversified into making ice cream back in the ’90s, it’s grown into a farm tour, an ice cream making experience, an adventure playground and several acres of walks. They haven’t stopped innovating, as the farm is about to embark on an interesting experiment with their dairy cows: the calves are going to be kept with their mothers for nine months, rather than separated. Aside from a pleasant holiday, I’m mainly in Scotland for Jiu Jitsu Style magazine, to get material for the ‘JJS on the Road’ column. Scott McVeigh is one of the few black belts in Scotland, under the man many people still credit for their entrance into BJJ: Royce Gracie. I had the pleasure of interviewing Scott about the origins of Scottish BJJ, his time with the Gracie family and plans for the future (as ever, our chat should be appearing in JJS later this year), before putting on my gi to join in with training. Like you’d expect from a Royce Gracie school, there was some self defence to begin with, throwing them after you’re grabbed from behind. The main groundwork techniques were built around the scissor sweep, or rather, what happens if they block your scissor sweep. For example, there may be an arm in the way, meaning you can’t bring your leg across their stomach properly. Instead, that knee is going to go over their blocking arm: you can then push with your leg to break their hold on your gi, simultaneously pulling with your own grips on their sleeve and collar. As soon as you bypass their arm, circle the same leg up around their neck, then move into the triangle. Another alternative is for when you’re trying the sweep, but decide to switch to a sort of reverse scissor sweep. Your shin is across their stomach for the scissor sweep, with a grip on the collar as well as their same side sleeve. Rather than pulling them onto you and chopping out their leg, switch your sleeve grip to their opposite arm (so, that will be the arm next to the foot of the leg you have across their stomach) and yank it across their body. Next, release their collar and instead reach around to their opposite armpit, bringing them in tight. As when you’re trying to take the back, you need to press your chest into the back of the arm you pulled across their body, so they can’t pull it back out. On the same side as the arm you’ve trapped, put your shoulder back on the mat, which should enable you to fling them over with your braced leg and move into side control. If they sprawl, you can take their back. Though their sprawl will make it hard to get the above sweep, you can now just bring your free foot between their legs and swivel around to their back. Scott advised that I should be pressing with my heels rather than trying to curl my instep and toes for grip, as the latter could get hurt should they try and roll out. During sparring, I stayed defensive as usual. I’m already passive when training, so when visiting other clubs, my passivity gets almost catatonic (unless my training partner is inexperienced or much smaller, in which case I try and flow through a few positions). Interestingly, one of my rolling partners went for a footlock, which doesn’t happen all that often. I did the usual defence of sitting up and grabbing a collar, trying to sit through to mount. It’s good to have that reminder, given that even under IBJJF rules, white belts can throw a straight ankle lock. I really liked the atmosphere at Royce Gracie Scotland, which felt informal and friendly. That’s a reflection of Scott’s character, who in many ways reminds me of one of my own instructors, Kev at RGA Bucks. Both of them give a strong impression that their main concern is how to improve their students’ BJJ, as opposed to how much money they can make. It’s been about a little over a month since I last popped up to my parent’s new place in Aylesbury. Last time it was to help them with their move, whereas this time it’s because I’m teaching a seminar at up Warwick Uni on Tuesday. I was looking forward to seeing my sister and nieces again, as well as catch up with my old training partners at RGA Bucks. Like last time, my sister and entourage arrived around 11, but this time they were only staying until around 4 or 5pm. So, due to wanting to see them, that meant again I didn’t stay for the open mat. Thanks to my sister’s mother-in-law, who had flown over from Canada the day before, I was able to test out my new ripstop gi (which I’ll review when I’ve rolled in it a few more times), a birthday present from earlier in the eyar. She had very kindly both taken delivery of the gi in Vancouver, then brought it with her on the flight. You should still be controlling their other arm. Make sure that is pulled towards you, so they can’t initiate their defence by tucking the elbow inside your leg. Grab your shin with your free hand, then lock in the triangle. Raise your hips to isolate their trapped arm, then push it across their body. You can now squeeze to finish for the triangle: it may help to swivel towards the knee of your neck leg to create a better angle. If they tuck their chin to try and block the choke, it is worth continuing to try for the submission, as it is likely that they’ll eventually shift to stop the discomfort. However, be careful they don’t manage to wriggle backwards and slip out: this is a particular concern in nogi, where you don’t have the friction of the gi to help hold them in place. Also don’t forget you can always switch to an armbar or omoplata. During specific sparring, I ended up in a three. Originally it was just with Callum, but a blue belt who didn’t have a partner asked to join in. I had trouble controlling his speed, coupled with his very attacking style. I don’t encounter that approach often, probably because I intentionally avoid that kind of competitive roll. Either way, my super-defensive approach often fails me when I’m sparring somebody willing to push the pace and just keep throwing attack after attack. So, another obvious point is that I shouldn’t stay down in guard all the time fending off attacks: eventually I’ll get tapped. Instead, I should be looking to pass straight away. Getting swept is better than getting tapped, after all, as at least after a sweep you can keep working during free sparring. Underneath, I kept going for a handstand sweep, but without much success. I then switched to a star sweep (when you spin around their leg and pull up, to knock them backwards), but couldn’t quite get it. I had their foot, but wasn’t able to knock them flat onto the floor. Partially that was because I was a bit worried about tweaking their knee or something, but he said it was fine.